Created on Jan. 28, 2013, 12:14 p.m. by Hevok & updated by Hevok on May 2, 2013, 4:44 p.m.
Data on Aging need to be visualized with an interactive and intuitive interface that enables collaborative reverse-engineering of the Aging process. It shall be a popular and interactive way of to convey a basic understanding of the mechanisms of Aging to a variety of users. Dozens of static maps on Aging have been attempted to be created, though there is nor unified model that is able to scale up. An dynamic attractive 2D graph representation is required and later on converted into a 3D version which will be even much more engaging and thought-provoking. It can be seen as an interactive tutorial or textbook about the mechanism of Aging and therefore also serve educational purposes and train non-scientists to become scientist as well. 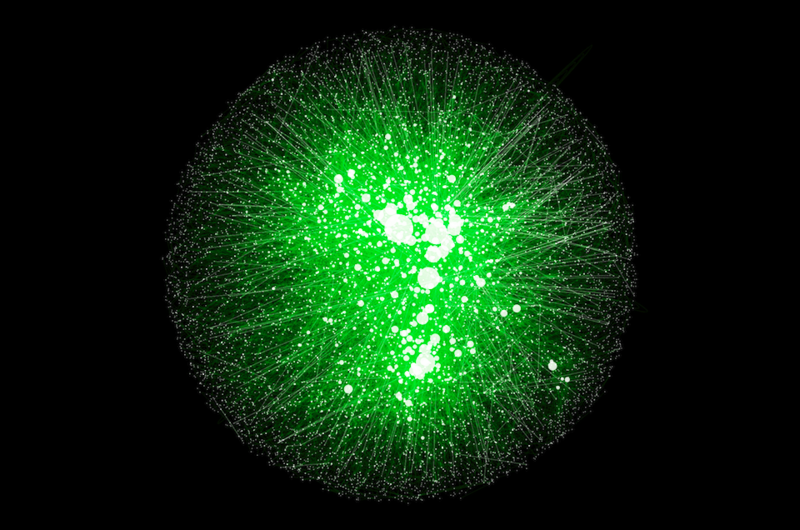 There is an impossible amount of hard work needed to fill data for such a graph by one person, but thousands of users can fill it within weeks and adjust it according to new Science quickly. It should make the Science of Aging more understandable, accessible and intuitive. We will organize a database for all kind of interactions related to Aging and generate the graph in real-time as well as periodically update it from external resources. A user can click on interesting organ, system or link and find all known Relations and Interactions with links to Studies (References). It shall contain all the age-related changes occurring on different levels. Known interventions/cures/treatments shall be linked to the graph too. It can be expanded with a list of supplements that can interfere with each part of the Aging process. A pathway shall light up if an event or component is selected/touched. In the graph each element should be "light-up" or have a colored halo around it when a mouse courser hovers over it. The connecting lines would also become enhanced as well. Further, some motion effect in the lines can show how one element causes or influences others. The graph will be composed of Data Units with each one having at least a short name (title) and a description (text) and optionally allow to have additional properties/attributes associated to every Data Unit that makes up a node or an edge. All the objects have to be dynamic, there shall nothing be static (hard-coded) and write in stone, but instead really made dynamic and subjective to Changes both in Design and input data. In such the map will be highly flexible and can evolve rapidly and will be kept up-to-date with the current knowledge. Therefore the map consists of objects with properties and links including categories (disease, nutrition and so on). Then a person can simple add a link to an object and provide a reference for it. S/he can also simply create an object and add properties like a description. It is a kind of Wikipedia (a Wiki-like data model), but more interactive and with a intuitive interface. This kind of design helps to grow it more easily as it would allow to submit, others to review and accept then it is added and therefore allowing the site to grow a lot. This is a good start for an initial iteration. What needs to be achieved initially is one simple interactive web page that drives more participation. Dynamic Widgets are perfect here because that way a person can edit the page to focus on what matter to her/him (What is more interesting for them and what they use more). Widgets can also be used to select current tasks that need to be accomplished and provide information on action of work. To reduce the complexity of the graph there shall also be filters for someones Objective/Research interests which can be accomplished with different categories made up by Data Units that represent for instance different types of biomarkers. A search field shall enable to find Data Units of interests, and the search need to be able to be narrowed down by categories. A user need to be able to navigate through the graph. To lower the number of nodes, s/he needs to be enable to choose a root node and the view goes to the closest nodes only, then it is possible to choose another node and it goes to the centre [http://webbrain.com/brainpage/brain/0CE739C8-ED6C-F480-D3DC-4E8B4BE43C94]. The representation need to be scalable (zooming) from small to large levels [http://htwins.net/scale2/lang.html]. Therefore we will provide zooming techniques to show different elements for each of the zooming layers. 8 different layers need to be provided. An alternative Interface shall be provided: A simple for the public and more sophisticated version for experts. Later on it shall also have a customizable personalized different option widget panels. The website need also be able to be skinned/themes for more users to enjoy it. It should also be possible to connect a personal profile to the graph so that individuals can see how their lifestyle habits have impact on the Aging process and therefore encourage as well as guide to have a better lifestyle. Researchers themselves can be nodes (categories) in data. Like select an initial category (e.g. cancer), then select a Scientist's graph, there is a category for Research that is related to that node. That way an advanced user can have all the References, but it would not be a problem for the simple user. The way schemas on aging are presented need to be radically improved. We need to make it more accessible to a wider audience and more interactive as well as collaborative. The interactive graphic/website/diagram should have a very basic - yet engaging - front end, and a robust database-driven scientific backend. In the long term 3D network/graph presentation of the schema will make it even more engaging. We will provide on Denigma a gaming-like environment to assemble a beautifully graph representation of the Aging process an its attack points for anti-Aging Interventions. It will be based on databases and be fully crowd-sourcing enabled (even for non-technical non-scientist). This model will allow to perform computation on collaborative knowledge-base. Machine algorithms can complement missing information and enable to infer causal relationships.